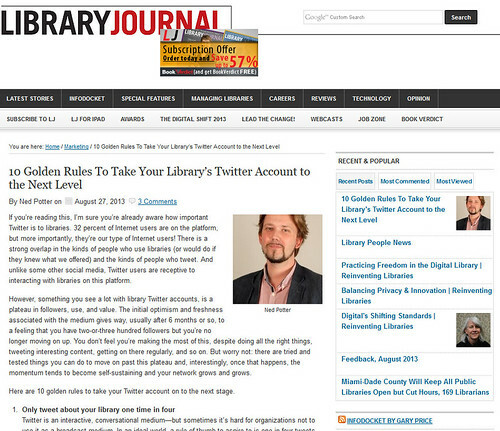 I've recently become a columnist for Library Journal, along with several others, as part of an Advocates Corner feature all about library marketing and advocacy. Here's where you can read the first of my columns, about the increasingly important practice of marketing with video. The second one went online last week - you can read it here. It's about creating ambient awareness of the Library as authoritative source - the reason it doesn't say that in the article itself is that it's a much better way of putting it than I could come up with myself! The particular phrase comes from Valarie Kingsland, as part of this tweet responding to the article (see more response below). The central tenet of the article is something I first grasped when Terry Kendrick explained it to me - that it's very hard to get anyone to take an action as a result of any one-off piece of marketing, and that it is this unrealistic expectation which leaves so many library marketers disappointed. You really have to build an awareness of what you do over time, so you're the first thing people thing of when they DO need your services - rather than expecting them to drop what they're doing and run to the Library when they see your tweet / poster / email / leaflet or whatever... Hence the title of the column - marketing libraries is like marketing mayonnaise, in that no one sees an ad for Hellman's Mayo and rushes out to buy some, but when it comes to the time when they need mayonnaise, Hellman's are foremost in their minds because they see so many ads and promotions. Read the article to see what I'm on about! The reaction to the piece was fantastic, and I'm really pleased to see how many people really 'got' it. I've documented a small selection of it on Storify.